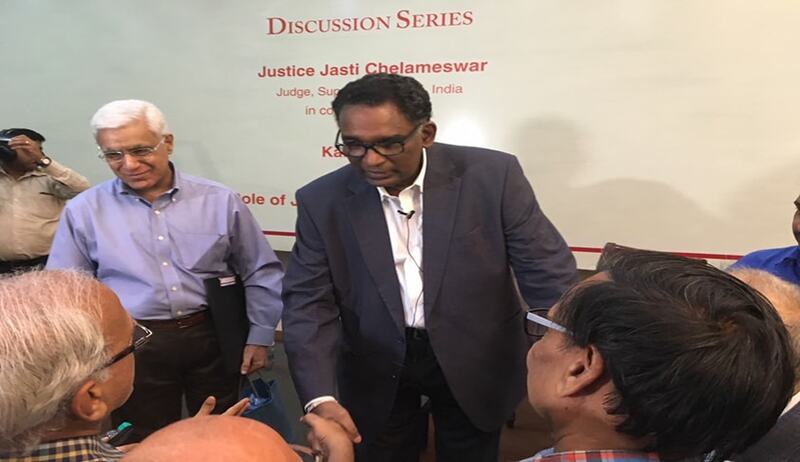 The Harvard Club of India hosted an event on Saturday at the Constitution Club of India, New Delhi, with acclaimed journalist Mr. Karan Thapar interviewing Supreme Court Justice J. Chelameswar on the ‘Role of Judiciary in a Democracy’. As the interview progressed, it was clear that it was the sub-text, that is, the January 12 press conference by the four senior Judges of the Supreme Court, and its aftermath, that would dominate their discussion. While much has been reported about their conversation, it was the silences of Justice Chelameswar to some questions, which Karan Thapar found eloquent. As Karan Thapar remarked: “ It is the silences, the hoong...hoong of Justice Chelameswar that would leave the lasting imprint of this hour-long conversation”. Thapar: Union Law Minister Ravi Shankar Prasad had, in an interview to the Hindustan Times dated February 24, 2017, spoke about the need to audit the present collegium system post the experience in Justice Karnan’s case. Justice Chelameswar: No system is perfect and there is always scope for improvement and hence, the necessity of auditing the system. Justice Chelameswar- “The choice of words is yours (laughter)...hoong, followed by a spell of silence lasting for a minute. Thapar: Should not the Collegium reiterate the recommendation to elevate Chief Justice of Uttarakhand High Court, Justice K.M.Joseph and the senior advocate, Indu Malhotra, as the Centre has not taken further steps following the earlier recommendation? Justice Chelameswar: hoong. Silence, with a body language suggesting that the Collegium members are helpless. Thapar: Are you reluctant to reply to this because it would embarrass the CJI. Justice Chelameswar: No. It is more an embarrassment to myself. Thereupon, Thapar read from the collegium resolution published on the Supreme Court website wherein it had been observed that Chief Justice Joseph is worthier than the Chief Justices and senior judges of most other High Courts. “Does this not imply tremendous support for Chief Justice Joseph?”, he inquired. *Continuing in the same thread, Justice Chelameswar cited the instance elaborated by eminent jurist and renowned Senior Counsel Fali S. Nariman in his autobiography ‘Before Memory Fades’, when, upon the proclamation of emergency in 1975, to decide on the power of High Courts under Article 226 to examine if orders of preventive detention were in accordance with the Maintenance of Internal Security Act, by the intervention of the then Attorney General C. K. Daphtary, the then CJI A. N. Ray had constituted a bench of the five seniormost judges of the Supreme Court. Continuing, when Thapar asked if the objective behind selecting benches of preference is to benefit the Executive, Justice Chelameswar replied that he would refrain from answering the question. “Silence can be interpreted in many ways”, noted Thapar. “Is the purpose of assigning important cases to comparatively junior judges is that they are deemed to be more pliant?”, pressed Thapar. Refuting the contention regarding pliancy, as he did not believe in the hierarchy of Judges for deciding cases, Justice Chelameswar reiterated the concern regarding the integrity of the institution. Justice Chelameswar- “he is the master of the roster; if the CJI wishes to handle most cases, he is entitled to...”, adding on a humorous note, “I am happy to do minimum work over the next few days (until his retirement on June 22)”. Justice Chelameswar- “the importance of a judge is not based on the nature of cases he adjudicates...I am more concerned about my contributions...” It is here Justice Chelameswar made his insightful philosophical remark: “Great things can be done in a small way while small things can be done in a great manner”. How this remark can be deciphered in the current controversy is anybody’s guess. Thapar- do we have sufficient grounds for impeachment of the CJI? Thapar- “ are you at all apprehensive that Justice Gogoi, co-author of the November 2017 letter and part of the January 12 press conference, may get superseded? On being inquired about Guideline 9 of the ‘Restatement of Values of Judicial Life’ on interviews by judges to the media, Justice Chelameswar remarked that the bar applies only to interviews on the judgments, and not otherwise. The one remark which drew instant applause from the audience was Justice Chelameswar’s assertion that upon his retirement, he shall not seek employment under any government. His last observation that we have not changed much from the culture of medieval India, which thrived on sycophancy, left the audience with much to introspect.